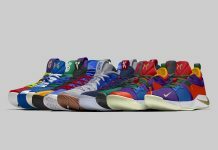 Nike Basketball and Kyrie Irving will officially release the Nike Kyrie 4 later this month before Christmas Day – which is when Kyrie will most likely lace them up for the first time at home against the Washington Wizards. Back in September, we got a teaser look at what to expect from Kyrie Irving while filming his upcoming Uncle Drew film. Today, we have more teaser photos of two upcoming colorways. One pair comes dressed in a Black/White-Anthracite-Light Racer Blue color scheme, while the other sports a clean Black and White hue. Both are constructed with a mix of nubuck and mesh and a midsole similar to the Kyrie 1. According to Foot Locker’s release calendar, the Nike Kyrie 4 “Light Racer Blue” will release on December 20th at select retailers. The retail price tag is set at $120 USD.